Brad Paisley and his wife (actress Kimberly Williams-Paisley) are celebrating six years together, along with the birth of their second son, Jasper Warren, who arrived last month. 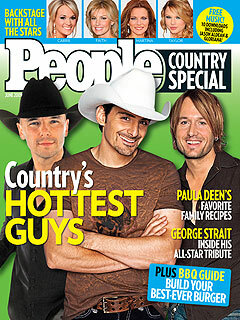 In People Magazine's June Country Special issue, Paisley opens up about what keeps their bond strong while juggling two demanding careers and two young boys-and it's not Brad's amazing guitar playing, songwriting, or the fact that he was chosen by the magazine as one of "Country's Hottest Guys" (along with Keith Urban, Trace Adkins, and Jake Owen). "Humor is the great equalizer, just like music," the 36-year-old singer says. "If you can make a woman laugh, you'll get to talk to her longer. When I learned how to be funny, it was life-changing." "As things begin to sag and looks fade," Paisley continues, "it's good to always have that sense of humor between you." Well, if People Magazine and Paisley's fans have anything to say, he doesn't have to start depending on the humor just yet. Check out more at People Magazine.